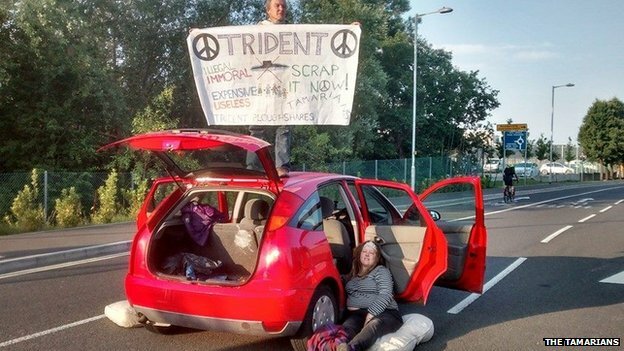 At six o’clock in the morning on July 25, a group of local people from Plymouth, Devon, Cornwall, Somerset and beyond blocked the main Camels Head entrance into Devonport Dockyard in Plymouth, England in order to stop the refitting of the Vanguard nuclear submarines which carry and launch the Trident nuclear weapon missiles. People used their own bodies and banners, as well as a car, to block the entrance into the base. Theo Simon and Nikki Clark, who chained themselves to the car, were arrested after police cut the locks. Both were charged with willful obstruction of the highway and later released on bail. They have a court appearance scheduled on August 13. “When we see things like with Israel in Gaza, we want our government to stand up for international law and humanitarian law. But it’s harder for Britain to condemn other peoples’ war crimes if we are prepared to commit one ourselves. That is exactly what is happening here in Devon – they are working on a weapon of mass destruction, which can never be used. “I’m here today because I believe the work that goes on here in refitting Britain’s Nuclear weapons system is immoral and dangerous. Trident could never be used legally as its use would constitute a war-crime. The government is trying to spend in excess of a £100 Billion pounds of taxpayer money renewing a global terror weapon which can never be used. Why should we live with Austerity just so that our government can throw its weight around the world? Trident Ploughshares is a national network of concerned people working to abolish Weapons of Mass Destruction, starting with the one on their doorstep: the Trident submarine based system. Trident Ploughshares’ valuable work has been recognised with a Right Livelihood Award, and a Nobel Prize nomination for founder member Angie Zelter.